This chapter is a survey of the literature of design studies, where the various characteristics of a phenomenon called design drawing, are considered. Included in this review is an exploration of the roles and attributes design drawing plays in those design fields outside ID, as an important design language. 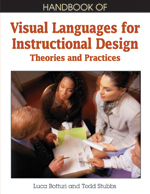 Its importance to those design fields suggests that design drawing might have much to teach us about Visual Instructional Design Languages (VIDLs). In reviewing these attributes of design drawing and how they are implemented in those other fields of design, we hope to inspire a dialogue on how these important characteristics will aid in creating or nurturing VIDLs.